Cover artwork: Livre du Cueur d'Amours Espris (Cod. 2597, fol. 15r). This album, the fourth in our planned cycle of complete Josquin Masses, was nominated for a Grammy Award in 2010. It has recently become a favourite intellectual game to compare Josquin’s career with that of Beethoven. Essentially the point is that Josquin was as influential a composer in his time as Beethoven was in his; but the subplot is that Josquin ought to be taken as seriously as any later composer even though he lived so long ago and only wrote for voices. To invoke his name in the same breath as Beethoven’s is the best way to put him where he deserves to be. The average music-lover will take the point. There isn’t much substance in this except to point out that Josquin travelled constantly whereas Beethoven didn’t. But one intriguing idea that has come out of the comparison is that a Josquin Mass is presented these days like a Beethoven symphony – a succession of movements, making a satisfying musical experience when performed without break, in a concert hall. Unlike a symphony, the Mass traditionally ends with a slow movement, the Agnus Dei, while stacking the most positive music in the middle of the succession of events, in the Gloria and Credo; but in the hands of a master this doesn’t matter, since the musical logic will extend through all the movements, culminating in the last one, pro­ducing a rounded emotional experience comparable to, if different from, that of a symphony. In fact I personally have come to think of Josquin’s sixteen or so authenticated Mass-settings as an equivalent achievement to Beethoven’s nine symphonies: each one exploring a different aspect of the form, each one an intellectual and technical tour de force, each one showing a different side of his personality. In this respect there is more substance in comparing Josquin with Beethoven than with, say, Mozart or Haydn, since Josquin and Beethoven both seemed more concerned to individualize every work they wrote, to make each work tell. The Mass-settings included on this disc are two of the finest to come from any pen. They are linked by having secular polyphonic songs as their models, coincidentally neither of which are safely attributed to any single composer. Malheur me bat is probably not by Ockeghem but by a little-known Flemish composer called Malcort, whose obscurity should not detract from the beauty of his song, nor from the fact that it became a favourite model for Mass-settings by composers active around the year 1500. How strange, then, that not one of the nine sources for it provides any words apart from the title – the performance given by The Tallis Scholars at the 2008 Promenade Concerts in the Royal Albert Hall, London, was made possible by commissioning a contemporary poet – Jacques Darras – to complete the text. The attribution of Fortuna desperata to Antoine Busnoys is more secure, though the manu­script evidence is not conclusive. The two Masses sung here are also linked by the way Josquin borrowed his material from the chansons. Both of these chansons were three-voice compositions. Before Josquin the normal procedure in basing a Mass-setting on a chanson was to take one of the original voice-parts, often the tenor, and derive all the motifs to be used in the Mass from it. This was called paraphrasing a melody. However in these two settings Josquin went a stage further by plundering all three of the voice parts for quotable material, at a stroke tripling the stock of ideas he could draw on. Thus the art of parodying a poly­phonic model was born, in which tradition Missa Fortuna desperata, which is reckoned to be earlier than Missa Malheur me bat, was one of the first. We can hear Josquin refining and developing these techniques in Missa Malheur me bat. These techniques are astonishingly complicated. Just about every bar of every movement on this disc is underpinned by a quotation from the model in question, though there seems to be no logic to how Josquin decided which of the three voices he was going to home in on, or whether more than one is being used at any given moment (all three tend to appear at the beginning of the movements), or what speed the chosen melody is being quoted at. In general he liked to construct his polyphonic lines out of quite short motifs, often quoted as sequences which become building blocks (the Sanctus of Missa Fortuna desperata gives a good example of this). More often than not his resourcefulness is not clearly audible: the best chance of hearing the chanson material is when he quotes their melodies in very long notes. This happens in the Credo of Missa Fortuna desperata, for example, where he takes the top part of the chanson and quotes it four times in the top part of the Mass in ever diminishing speeds (in the ratio 8:4:3:2), giving the movement a power­ful drive to its end since the last statement is going four times faster than the first. But the processes can be opaque: in Missa Malheur me bat, in both the Gloria and the Credo, he quotes a melody, stops, goes back to the beginning of it again and quotes more of it, stops again, returns again to the begin­ning and quotes yet further in a kind of expanding loop. Yet this thematic scaffolding is only part of the story. Around the ‘big’ quotations, Josquin borrows or invents literally endless tiny motifs, which serve to disguise the pure mathematics which underlie so much of the writing, while at the same time expres­sing the essential nature of the texts and driving the musical argument forward. All this wisdom in the art of composition cul­minates in these Masses, as it tended to culminate in the Romantic symphony, in the last movement. By intensifying the learning which underlies both Agnus Dei settings, as well as intensifying the symbolism inherent in the borrowed themes, Josquin in his own style achieves a symphonic breadth of expression. In the Agnus settings on this disc he was thinking as follows: Missa Malheur me bat’s Agnus has three invocations, which was the normal procedure in Josquin’s time and place. Missa Fortuna desperata only has two, though it is possible that a two-voice section, which would have come between the two four-part ones that exist, has got lost over time. In the first Agnus of Missa Malheur me bat the tenor carries a simplified version of the chanson tenor in long notes, while the other voices surround it with a classic example of Josquin building blocks with a repeating motif. The second Agnus, for two voices, is a free canon at the second. This, the most difficult canon of all to write, produces a mesmerizing, unearthly effect. 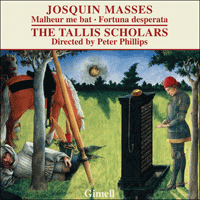 The third Agnus is one of the great tours de force of the repertory, similar in method to the final Agnus of Josquin’s Missa L’homme armé sexti toni. The four voices of the earlier movements have become six. The outside parts of the chanson are retained without alteration while the middle part of the original is removed altogether and replaced with a double canon (that is, with two sets of two voices in canon with each other). In this way the music from the chanson acts as a scaffolding for the filigree detail of the canonic parts, coming and going as they like, as it seems outside time. In the Agnus Dei of Missa Fortuna desperata Josquin invented an arguably simpler but no less effective formula. Again we are in the world of building-block motifs, but this time over a very long-note bass part, which at times explores the most sonorous depths of the voice. In the first Agnus these bass notes are formed from the original top part of the chanson, transposed down an octave and a fifth, augmented and inverted. The second Agnus follows the same pattern, only now the bass long-notes are taken from the chanson’s tenor, here transposed down an octave but uninverted. It has been suggested that the inversion in the first Agnus was intended to represent a catastrophic turn of Fortune’s wheel, with the return to normality made possible through the good offices of the uninverted melody in the second Agnus. However one likes to view the very plausible symbolism inherent in these Agnus Deis, there can be no denying that by reviewing at the end the themes which have been circulating throughout the earlier movements Josquin brings his settings to a deeply satisfying conclusion. Not that the listener will consciously grasp everything that is happening – one needs a score for that, and even then it is hard to spot all the references. But subconsciously the mind is enthralled. Comparer les carrières de Josquin et de Beethoven est devenu l’un des grands jeux intellectuels du moment. Cela tient surtout au fait que Josquin fut, en son temps, un compositeur aussi influent que Beethoven en le sien; mais plane aussi, en arrière-fond, l’idée que Josquin mérite d’être autant considéré que les compositeurs ultérieurs, même s’il vécut il y a bien longtemps et même s’il écrivit seulement de la musique vocale. Invoquer son nom en même temps que celui de Beethoven est la meilleure façon de lui rendre justice. Les mélomanes moyens verront de quoi il retourne. Cette comparaison ne révèle guère qu’une chose: Josquin voyagea constamment, à l’encontre de Beet­hoven. Mais il en est aussi ressorti, qu’aujourd’hui, bizarrement, on présente une messe josquinienne comme une symphonie beethovénienne—une succession de mouvements donnant lieu à une expérience musicale probante quand on l’interprète d’un trait, en concert. Contrairement à une symphonie, la messe s’achève traditionnellement sur un mouvement lent, l’Agnus Dei, tout en accumulant les épisodes les plus affirmatifs au milieu des événements qui s’enchaînent, dans le Gloria et le Credo; mais, entre les mains d’un maître, cela importe peu, car la logique musicale s’étend à tous les mouvements pour culminer dans le dernier et offrir une expérience émotionnelle complète comparable, quoique dissimilaire, à celle d’une symphonie. Personnellement, j’en suis venu à con­sidérer les seize et quelques messes authentifiées de Josquin comme un équivalent des neuf symphonies de Beethoven: chacune explore un aspect particulier de la forme, chacune est un tour de force intellectuel et technique, chacune dévoile une facette de la personnalité du compositeur. À cet égard, il y a davantage matière à comparer Josquin à Beethoven qu’à, disons, Mozart ou Haydn, moins soucieux, semble-t-il, d’individualiser chacune de leurs œuvres, de les rendre marquantes. Les messes de ce disque sont deux des plus belles messes jamais venues sous la plume d’un com­positeur. Elles prennent pour modèle des chansons polyphoniques profanes qui, fortuitement, ne sont attribuées à aucun compositeur avec certitude. Malheur me bat n’est probablement pas d’Ockeghem mais d’un compositeur flamand méconnu, un certain Malcort; le fait qu’il soit obscur n’enlève d’ailleurs rien à la beauté de sa chanson, qui fut un des modèles préférés des compositeurs de messes actifs vers 1500. Comme il est étrange, alors, que les neuf sources dont nous disposons ne nous en donnent que le titre – The Tallis Scholars n’auraient pu interpréter cette œuvre aux Promenade Concerts de 2008 (au Royal Albert Hall de Londres) sans avoir préalablement demandé au poète Jacques Darras d’en compléter le texte. L’attribution de Fortuna desperata à Antoine Busnoys est plus sûre, malgré des preuves manuscrites peu convaincantes. Les deux messes réunies ici sont également liées par la manière dont Josquin emprunta son matériau aux chansons, toutes deux à trois voix. Avant lui, pour fonder une messe sur une chanson, on prenait une des parties vocales originales, souvent le tenor, et on en faisait dériver tous les motifs. On appelait cela paraphraser une mélodie. Or, dans ces deux messes, Josquin va plus loin et, cherchant un matériel digne d’être cité, il pille les trois parties vocales, triplant d’un coup le stock d’idées où puiser. Ainsi naquit l’art de parodier un modèle polyphonique, une tradition dans laquelle la Missa Fortuna desperata (considérée comme antérieure à la Missa Malheur me bat) fut parmi les premières à s’inscrire. Ces techniques, Josquin les affina et les développa dans la Missa Malheur me bat. Ce sont des techniques étonnamment complexes. Chaque mesure ou presque de chaque mouvement de ce disque est étayée par une citation du modèle, même si aucune logique ne semble permettre de déterminer comment Josquin décida laquelle des trois voix il fallait mettre en avant, s’il fallait en utiliser plus d’une à un moment donné (les trois tendent à apparaître en début de mouvement), ou à quel tempo il fallait citer la mélodie choisie. En général, il aimait construire ses lignes poly­phoniques à partir de motifs très courts, souvent cités sous forme de séquences qui deviennent un jeu de cubes (le Sanctus de la Missa Fortuna desperata l’illustre bien). La plupart du temps, son ingéniosité n’est pas clairement audible et la meilleure chance que l’on a d’entendre le matériel des chansons, c’est quand il cite leurs mélodies en notes très longues, comme, par exemple, dans le Credo de la Missa Fortuna desperata, où le superius de la chanson est cité quatre fois au superius de la messe, dans des tempos toujours diminuants (dans la proportion 8:4:3:2); le mouvement est donc puissamment poussé vers sa conclusion, la dernière énonciation étant quatre fois plus rapide que la première. Mais Josquin recourt parfois à des procédés opaques: dans le Gloria et le Credo de la Missa Malheur me bat, il cite une mélodie, s’arrête, revient à son début et en cite un peu plus, puis s’arrête de nouveau, revient au début et en cite encore un peu plus, dans une sorte de boucle extensible. Cet échafaudage thématique n’est pourtant qu’une partie du schéma. Autour des «grosses» citations, Josquin emprunte ou invente de minuscules motifs littéralement sans fin, qui servent à masquer la pure mathématique sous-tendant une très large part de l’écriture, mais qui expriment aussi la nature fondamentale des textes tout en donnant de l’élan à l’argument musical. Toute cette maîtrise de l’art compositionnel culmine ici dans le dernier mouvement, comme elle tendit à le faire dans la symphonie romantique. En intensifiant la science qui est à la base des présents Agnus Dei, mais aussi le symbolisme inhérent aux thèmes empruntés, Josquin atteint, dans son style propre, à un souffle expressif symphonique. Voici comment il envisagea les Agnus de ce disque: celui de la Missa Malheur me bat a trois invocations comme le voulait alors l’usage. La Missa Fortuna desperata, elle, n’en a que deux, même si une section à deux voix – qui devait être intercalée entre les deux sections à quatre parties existantes – a pu se perdre avec le temps. Dans le premier Agnus de la Missa Malheur me bat, le tenor véhicule une version simplifiée du tenor de la chanson en longues, cependant que les autres voix l’entourent avec de classiques cubes josquiniens dotés d’un motif à répétition. Le deuxième Agnus Dei, à deux voix, est un canon libre à la seconde (le plus difficile de tous à écrire) qui produit un effet hypnotique, surnaturel. Le troisième Agnus est l’un des grands tours de force du répertoire, avec une méthode similaire à celle du dernier Agnus de la Missa L’homme armé sexti toni de Josquin. Il n’y a plus quatre voix, comme dans les mouvements antérieurs, mais six. Les parties extrêmes de la chanson sont inchangées tandis que la partie centrale de l’original est entièrement remplacée par un double canon (i.e. par deux séries de deux voix en canon l’une avec l’autre). De cette manière, la musique de la chanson fait comme un échafaudage au détail filigrané des parties canoniques qui vont et viennent à leur guise, comme hors de mesure. Dans l’Agnus Dei de la Missa Fortuna desperata, Josquin inventa une méthode plus simple, si l’on veut, mais tout aussi efficace. Nous retrouvons l’univers des motifs-cubes, mais cette fois par-dessus une partie de basse en très longues notes, qui explore parfois les tréfonds les plus retentissants de la voix. Dans le premier Agnus, ces notes de basse sont formées en s’appuyant sur le superius original de la chanson, transposé à l’octave et à la quinte inférieures, augmenté et renversé. Le second Agnus suit le même schéma, si ce n’est que les longues de la basse sont empruntées au tenor de la chanson, transposé à l’octave inférieure mais non renversé. D’aucuns ont suggéré que l’inversion, dans le premier Agnus, visait à symboliser un tour catastrophique de la roue de la Fortune, le retour à la normalité se faisant par les bons offices de la mélodie non renversée du second Agnus. Quelle que soit la manière dont on apprécie le symbolisme, tout à fait plausible, de ces Agnus Dei, on ne peut nier que passer un revue, à la fin, les thèmes qui ont circulé dans les différents mouve­ments permet à Josquin de conclure ses œuvres d’une façon profondément satisfaisante. Non que l’auditeur saisisse consciemment tout ce qui se passe – il faudrait pour cela une partition et encore, même là, on peine à repérer toutes les références –, mais on a l’âme inconsciemment captivée. Es ist seit einiger Zeit ein beliebtes Gedankenspiel, die Karriere Josquins mit der von Beethoven zu vergleichen. Dabei geht es in erster Linie darum, dass Josquin zu seiner Zeit als Komponist ebenso einflussreich war wie später Beethoven. Zudem wird damit ausgedrückt, dass Josquin ebenso ernst genommen werden sollte, wie die berühmten, jüngeren Komponisten, obwohl er vor so langer Zeit lebte und nur für Singstimmen komponierte. Seinen Namen im gleichen Atemzug mit Beethoven zu nennen ist vielleicht die beste Lösung, Josquin den Ruf zu verschaffen, der ihm zusteht. Der durchschnittliche Musikliebhaber hört so sicherlich entsprechend auf. Besonders weitführend ist dieses Spiel allerdings nicht, außer dass man aufzeigen könnte, dass Josquin ständig auf Reisen war, Beethoven hin­gegen nicht. Eine interessante Idee, die sich jedoch aus dem Vergleich ergibt, ist, dass eine Josquin-Messe heutzutage genauso wie eine Beethoven-Sinfonie präsentiert wird, nämlich als eine Reihe von Sätzen, die, wenn sie im Konzertsaal ohne Pause vorgetragen werden, für ein befriedigendes musikalisches Erlebnis sorgen. Anders als eine Sinfonie endet die Messe normalerweise mit einem langsamen Satz, dem Agnus Dei, während die fröhlichste Musik in den aufeinanderfolgenden Sätzen Gloria und Credo erklingt. Doch in den Händen eines Meisters hat das nicht allzu viel zu sagen, da sich die musikalische Logik durch alle Sätze erstreckt und im letzten ihren Höhepunkt erreicht und für ein abgerundetes emotionales Erlebnis sorgt, was – trotz aller Unterschiede – an das bei einer Sinfonie erinnert. Persönlich halte ich sogar die rund 16 Messen, die Josquin sicher zugeschrieben sind, für eine ebenso große Errungen­schaft wie Beethovens neun Sinfonien: jedes Werk setzt sich mit einem unterschiedlichen Aspekt der Form auseinander, jedes ist eine intellektuelle und technische Meisterleistung und zeigt jeweils eine unterschiedliche Seite seiner Persönlichkeit auf. Von dem Gesichtspunkt her ist der Vergleich Josquins mit Beethoven fundierter als es etwa mit Mozart oder Haydn der Fall wäre, da es sowohl Josquin als auch Beethoven am Herzen lag, jedes einzelne Werk zu individualisieren und aussagekräftig zu machen. Die beiden Messevertonungen auf der vor­liegenden CD gehören zu den besten überhaupt. Sie hängen insofern miteinander zusammen, als dass beide weltliche, polyphone Lieder als Grundlage haben, die beide jeweils nicht einem einzelnen Komponisten sicher zugeschrieben werden können. Malheur me bat ist wahrscheinlich nicht von Ockeghem sondern von einem relativ unbekannten flämischen Komponisten namens Malcort, dessen Obskurität nicht von der Schönheit dieses Liedes ablenken sollte, noch von der Tatsache, dass das Lied um 1500 herum als Grundlage für Messe­vertonungen besonders beliebt war. Es ist daher ausgesprochen seltsam, dass in keiner der neun Quellen, mit Ausnahme des Titels, der Text angegeben ist – die Aufführung der Messe, die The Tallis Scholars 2008 anlässlich der Promenade Concerts in der Londoner Royal Albert Hall gegeben haben, wurde dadurch ermöglicht, dass ein zeitgenössischer Dichter – Jacques Darras – damit beauftragt wurde, den Text zu vervollständigen. Fortuna desperata hingegen kann mit größerer Sicherheit Antoine Busnoys zugeschrieben werden, obwohl das Manuskript keine eindeutigen Beweise dafür liefert. Die beiden hier vorliegenden Messen hängen auch aufgrund Josquins Kompositionstechnik mit­einander zusammen. Sein Material stammte aus zwei Chansons, die jeweils dreistimmig waren. Bei Messevertonungen, die auf einer Chanson basierten, gingen die Komponisten vor Josquin so vor, dass sie eine Originalstimme der Chanson, meistens den Tenor, als Vorlage nutzten und aus ihr alle Motive für die Messe ableiteten. Das nannte man eine Melodie paraphrasieren. In diesen beiden Ver­tonungen ging Josquin jedoch einen Schritt weiter und bediente sich nicht nur aus einer, sondern aus allen drei Stimmen und verdreifachte so also auf einen Schlag das musikalische Material, das er verwenden konnte. So entstand die polyphone Parodierkunst und die Missa Fortuna desperata, die als älter gilt als die Missa Malheur me bat, ist eines der ersten Werke in dieser Tradition. In der Missa Malheur me bat kann man deutlich hören, wie Josquin diese Technik verfeinert und erweitert. Diese Kompositionstechniken sind erstaunlich kompliziert. Praktisch jeder Takt der vorliegenden Aufnahme ist von einem Zitat des jeweiligen Vorbilds untermauert, obwohl Josquin anscheinend weder bei seiner Motivwahl aus den drei Stimmen, noch bei der Entscheidung, ob mehr als eine ein­gesetzt werden solle (obwohl bei den Satzanfängen meist alle drei vorkommen), noch bei der Tempo­wahl für die jeweilige Melodie nach logischen Prinzipien verfährt. Im Allgemeinen arbeitet er in seinen polyphonen Sätzen mit relativ kurzen Motiven, die oft die Form von Sequenzen annehmen und dann als solche zu Bausteinen werden (das Sanctus der Missa Fortuna desperata verdeutlicht dies). Oft ist sein Einfallsreichtum jedoch nicht so offensichtlich: am besten kann man das Chanson-Material heraushören, wenn er die Melodien in sehr langen Noten erklingen lässt. Dies passiert zum Beispiel im Credo der Missa Fortuna desperata, wo er die Oberstimme der Chanson viermal in der Oberstimme der Messe in jeweils diminuierenden Tempi zitiert (im Verhältnis 8:4:3:2) und dem Satz so ein energisches Ende verleiht, da das letzte Zitat viermal so schnell ist wie das erste. Doch können die Vorgehensweisen auch verschleierter sein: in der Missa Malheur me bat zitiert er sowohl im Gloria als auch im Credo eine Melodie, hält inne, kehrt an den Anfang zurück, fährt fort, hält wieder inne, kehrt wieder zum Beginn zurück und fährt dann wieder­um, in einem immer weiter werdenden Kreislauf, fort. Doch ist dieses thematische Gerüst nur ein Aspekt der Kompositionsweise. Um die „großen“ Zitate herum fügt Josquin geradezu unzählige kleine, „geliehene“ und auch neu erfundene Motive ein, die das mathematische Element, das in seinen Werken so vorherrschend ist, verdecken und gleich­zeitig die Hauptaussage der Texte wiedergeben und die Musik vorantreiben. Ebenso wie die romantische Sinfonie erreicht auch diese kunstvolle Art der Messevertonung ihren Höhepunkt im letzten Satz. Josquin intensiviert ebenso den Lernprozess, der beiden Agnus-Dei-Vertonungen zugrunde liegt, als auch den Symbolis­mus, der den geliehenen Themen inhärent ist und er schafft so einen Ausdruck von symphonischen Ausmaßen. In den Agnus-Dei-Vertonungen, die hier vor­liegen, ist seine Herangehensweise folgendermaßen: im Agnus Dei der Missa Malheur me bat erklingen drei Anrufungen, was für Josquins Zeit und Hinter­grund die normale Form war. In der Missa Fortuna desperata kommen jedoch nur zwei vor, wobei es aber möglich ist, dass ein zweistimmiger Teil existiert haben und zwischen den beiden vier­stimmigen Teilen, die überliefert sind, erklungen sein könnte und heute verschollen ist. Im ersten Agnus Dei der Missa Malheur me bat singt der Tenor eine vereinfachte Version der Chanson-Tenorstimme in langen Noten, während die übrigen Stimmen ihn mit den typischen Josquin’schen Bausteinen umgeben, die sich aus einem Wieder­holungsmotiv zusammensetzen. Das zweite Agnus Dei ist zweistimmig und als freier Kanon im Sekundabstand angelegt. Diese Art von Kanon ist am schwierigsten zu komponieren und sorgt für einen hypnotisierenden, überirdischen Effekt. Das dritte Agnus Dei gehört zu den Meisterwerken des Repertoires und ist in ähnlicher Weise komponiert wie das letzte Agnus Dei in Josquins Missa L’homme armé sexti toni. Die vier Stimmen aus den früheren Sätzen sind nunmehr sechs. Die Außenstimmen der Chanson werden ohne Veränderungen beibehalten, während die Mittelstimme aus dem Original völlig herausgenommen und mit einem Doppelkanon (d.h. ein Kanon, in dem zwei Stimmenpaare gegen­einander gesetzt sind) ersetzt ist. Auf diese Weise fungiert die Musik aus der Chanson als Gerüst für die filigranen Details der Kanonstimmen, die anscheinend willkürlich kommen und gehen. Für das Agnus Dei der Missa Fortuna desperata entwickelte Josquin zwar eine schlichtere, aber dennoch nicht weniger wirkungsvolle Formel. Wiederum befinden wir uns in der Welt der Baustein-Motive, doch diesmal über einer Bass­stimme mit sehr langen Noten, die zuweilen auch die besonders klangvollen Tiefen der Stimme erkundet. Im ersten Agnus Dei leiten sich diese Bassnoten aus der ursprünglichen Oberstimme der Chanson ab, indem das Original um eine Duodezime nach unten transponiert, augmentiert und umgekehrt wird. Das zweite Agnus Dei ist nach demselben Prinzip angelegt, nur dass hier die langen Bassnoten aus dem Tenor der Chanson stammen, eine Oktave heruntertransponiert und nicht umgekehrt sind. Es ist angemerkt worden, dass die Umkehrung im ersten Agnus Dei eine katastrophale Wendung des Glücksrads darstellen könnte und dass die Rückkehr zur Normalität dann durch die nicht-umgekehrte Melodie des zweiten Agnus Dei bewerkstelligt würde. Wie man zu diesem plausiblen Symbolismus dieser Agnus Deis auch stehen mag, so gibt es jedoch keinen Zweifel daran, dass Josquin durch seinen abschließenden Rückblick auf die Themen, die sich durch die vorangehenden Sätze gezogen haben, zu einem sehr befriedigenden Ende kommt. Nicht dass der Hörer das alles bewusst aufnehemen kann – dazu braucht man die Partitur, und selbst dann ist es nicht einfach, alle Anspielungen zu erkennen. Unterbewusst ist der Geist jedoch verzaubert.